30-May-2001: Wings With Wires is a fledgling flight simulation gaming company that promises new experiences for the avid PC fly-body. Wings of Honor have recently conducted an interview with Dave Housteau, a member of the Wings With Wires team, and here is what he has to say. Wings of Honor: It has been stated that the Wings With Wires simulations are being created from scratch without ties to any existing flight sim. What is your approach and what makes it so different from the others? Dave Housteau: A major portion of new design is being creative in approach and not just remaking or improving upon what has already been tried. The Wings With Wires company is a celebration of early flight from before, and through, the Great War. This period of flight, especially up through the early war, has been neglected and its time has come. Our focus is not on the war itself, but on those magnificent aeroplanes that were developed because of it. We would like the players of our simulations to become as passionate and interested about these early flying machines as we are. We feel the best way to accomplish this goal is to immerse the player within a persistent on-line world of "danger and opportunity". This requires breaking a few traditional rules by moving the more dynamic single player aspects into the multi-player arena. It also requires looking elsewhere outside the parameters of flight simulators and into some of the more cutting edge fantasy and first person shooter games. From these we borrow and integrate the character animation and role playing aspects into our simulated worlds. Once immersed in our fully integrated simulations, the player will not find himself looking back at the static past of 85+ years ago. He will not be seeing through the eyes of some detached historian. Instead, he will be living that time as the present day, creating history from scratch. The player will take to the skies in completely modern, state-of-the-art, flying machines. 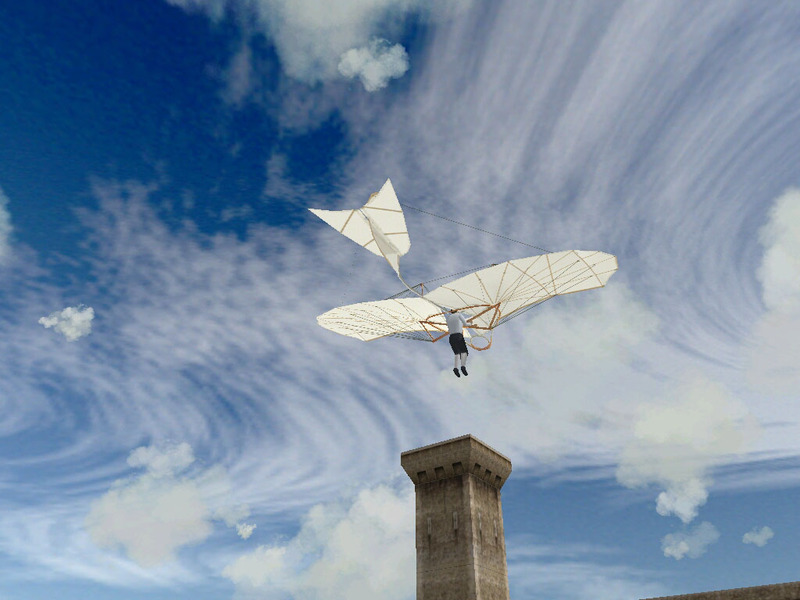 WoH: Since you are using OpenPlane technology, the ability for the customer to build new air-frames, and other objects, for the game is inherent. 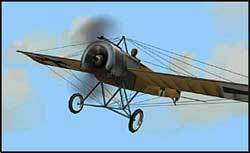 Given how difficult it is to do this now, how much easier will you be able to make it for the average fan to create his or her favorite WWI airplane? DH: The level of enjoyment derived from creating living art through OpenPlane varies from person to person. Some have as much fun with the challenge as they do with the highly accurate finished products. The most challenging aspect of OpenPlane has never really been the actual 3D modeling itself, but in having the correct data in place that will correspond to accurate flight and damage models. The complexity of this whole creative process will actually increase for the Wings With Wires simulations. The rendering of physical details on these aircraft will be set to a much higher standard, as will the flight and damage modeling. All of this may require more effort from the artist, but the end result is an increasingly more accurate and functional piece of 3D art. We are currently developing new tools, and improving existing ones, to aid us in the creation of these new simulations. It is too early to tell how or if these new tools will be made available commercially to the public. WoH: Will you be able to incorporate a utility that will allow end users to switch between paint jobs for any given plane? DH: In OpenPlane we call these skins. We are planning to have this feature with the ability to choose between both default and custom versions. WoH: How about the ability to see different skins on the same model aircraft while in the same mission? If that ability is built in, will it be comparable to how Red Baron II/3D handles this? DH: Your choice in skin will be viewable across the network. In the multi-player world of Red Baron everyone has the option to wear the paint of their choice, whether custom or default. In single player though, that privilege comes only with rank. In Wings With Wires, customized skins will also be an awarded privilege as a part of game design. WoH: I've read in another interview that when online, you can fly against a combination of real and AI pilots. May I have you elaborate on this a little? Will we be able to see collaborative team efforts to attempt to eliminate your chosen enemy, or will AI in the online realm be used primarily as an aid to fill slots in a game that could not be occupied by human pilots? DH: Total Immersion is what we are striving for. Wings With Wires will dissolve that line between single and multi-player versions of a flight simulation. . This concept will bring AI pilots into the multi-player environment. These AI pilots will have a similar role and function as they do in Red Baron's Dynamic Campaign Mode. As this traditional dividing line begins to melt away, the design for on-line play becomes proportionally more intelligent and more immersive for the player. The ability to command and control the AI may be worked in as a privilege of rank and earned status. The amount of AI on a particular server will be in balance to their human counterparts. With more actual players logged on, the number of AI will decrease. WoH: Will AI pilots be modeled to have fear built in? An example would be if you are flying in a formation of three aircraft, and you run across a lone enemy AI pilot who is lower than you. Will there be a mechanism to tell the AI pilot that he is out numbered and to make the appropriate decision, depending on his "fear/sanity" factor (will it try to run back home, or will it mindlessly seek to destroy your group, regardless of the odds)? DH: The provisions for modeling high quality AI are excellent within OpenPlane. They fly under the same physical limits using identical flight and damage models as the human pilots do. A self-preservation exit strategy is high on the agenda for modeling. We are very much against that entire fly-till-ya-die mentality, whether it is human or AI. Both will fly under the same conditions of not wanting to needlessly and foolishly throw their lives away. WoH: Will there be a place for the pilot that wishes to fly a reconnaissance aircraft in the multi-player world? DH: Absolutely! We will have this career option to choose from. It was a part of game design from the beginning. After all, this was the primary reason flying machines were brought to the front in the first place. 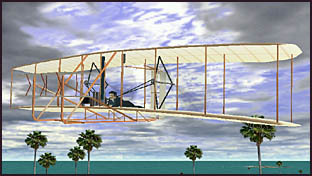 The role for these early aircraft was that of scout. It was the old role of the cavalry and no real surprise that several former cavalry officers became pilots. The early air war was all about information gathering. The development race began and continued throughout the conflict, from the need to either protect or intercept these observation aircraft. The player will be able to switch between the pilot and observer positions, while the AI takes over the vacant slot. On-line, both positions can also be manned with two different players. We are working on using character animation for communication between the two. WoH: I have recently read an interview, conducted by Ted Sacher, of a German WWI pilot named Otto Roosen. In his accounts, he has made mention of icing (even in summer months) while flying at high altitude. Will Wings With Wires be able to model this phenomenon in any of its games? How about added weight due to moisture in the canvas caused by wet weather. DH: This is an interesting question. Most of the flight designs we have been looking at have been low to medium altitude. We do have the capability to model this, but whether we do or not will be determined later as the priorities start to line up. One of the first things on the list is to model the individual engines, their maintenance, and operation more realistically. We want the players to have the option to fly the engine as well as the aircraft. WoH: Along with time-of-day support, will Wings With Wires support the change in seasons? Will we be able to see snow on the ground and in the trees? Will muddy landing strips be modeled, causing hardships while taxiing, and landing? DH: The time-of-day will be done along with certain changes in weather. It is too early to tell on the rest and how this will integrate into the graphics modeling. Taking off and landing our aircraft will never be a given and will require some thought and control. This was the cause of most air related fatalities during this period in history. Will changes in weather effect the coefficients for friction with the ground? That is a good question and one we will look into. WoH: Wings With Wires has been quoted as saying that it will incorporate a 'historically inspired' terrain. Does this mean that the terrain will look like, say, Flanders, but not faithfully detail its exact features? Will your terrain model actual six foot deep trenches--and shell holes--instead of clever graphical reproductions on a flat surface? DH: Yes, exactly. The terrain will be visually stunning, accurate for the time period and very cutting edge, but generic in nature. The final decision on how the servers will be set up will determine much with the final lay of the land. There will be lakes, rivers, and hills in certain areas where historically they may not have been. We will use geography to aid us in game design. Our terrain will not be of the flat photo-realistic variety that looses all dimension when flying at low levels. The visual detail will remain high when close to ground level. However, it is too early to know the exactness of those final details. WoH: Wings With Wires is currently working on two different flight simulations. Can you tell us how they are different from each other? DH: The first one is tentatively called Wings With Wires - First Flights and the second, Wings With Wires - Birds of Prey. Birds of Prey (BoP) is the multi-player combat simulation that most of these questions here have been dealing with. First Flights (FF) will actually be released first and it is a single player simulation. It is a celebration of very early flight from the Lilienthal gliders to the beginnings of the Great War. This simulation will have value to anyone that truly loves the dawn of aviation in its purest form. WoH: Simulations such as Red Baron II/3D and Fighter Squadron: Screaming Demons Over Europe have somewhat of a cult following; relatively small, but very loyal--and active!--communities to their respective games. It seems that these two sims are like wine; they get better with age. With both of these games, however, the user community has had to make improvements in game-play--basically without the help of their respective publishers--thus extending the life of their favorite simulations. How does Wings With Wires expect to support its fan base? DH: Wings With Wires will have a very strong up-front focus on community development and support. The very nature of the OpenPlane spec. invites the creative input from the community. We will have several avenues in place to channel this outside creativity. Our web site will be an integral part to this structure, consisting of a forum area and various pages directly linked to the happenings on the servers. Here you will see the top aces and reconnaissance pilots as well as what they have accomplished. There will be game replay features similar to the original Red Baron, except here you can have them viewable on the web site. You will have the evidence to back up your fish stories of the big one that got away--and those that didn't. These are just a few of the different options we are currently looking at. When the company was founded back in January, it was done so with the intent of not being a 'flash-in-the-pan'. Beginning with such a sound business foundation, we are staged to be around long beyond just the near future. As time goes by, the bonds formed with the community, partners, and those who wish to be affiliated with us, will only grow stronger. The simulations we currently have under construction are really just the beginning for us. WoH: Thank you, Dave, for taking time to talk with Wings of Honor.